Open slack and enjoy the darkness! Where to find this file if using Slack in Station app? When replying to a thread, the typed out text is hard to see. Any suggestions on making this darker? I made a quick shell script to automate the process, if you'd like. Here you go! We still need some love in the search results - currently very hard to read. and now when i open slack it just spins on the welcome message... suggestions? Then go back to terminal and press enter. It will dump your clipboard into the file. @codyolsen You have to use root to write into Applications folder. Thanks @codyolsen for the summary! Works great!! Thanks for gisting this! After upgrading to Mojave, slack's white back ground was piercing my eyes. If you want to be a bit cautious on the security front, you can download the css from https://cdn.rawgit.com/laCour/slack-night-mode/master/css/raw/black.css to a file (i.e. /Applications/Slack.app/Contents/Resources/slack-black.css) and load it from disk instead of over the internet. This worked for me, thanks to the above posts from @codyolsen and @marchrius. Any idea how to use this with Franz? If someone could take the time to do a darcula theme I will nut on video. Sidebar was still not quite what I wanted it to be. I'm using these colors to customize the rest of the client. For some reason this morning my reply in threads is now white again. Anyone else run into this? It has been working for months and even after I updated to 3.3.6. Yep, same here. White thread reply box. I was able to fix the updated thread reply box by setting the following although I'd prefer to do a fully updated css. This was quicker for now. Works very well, suggestions welcome. I'm still seeing Slack Posts with white text inside which makes it unreadable. Can one of you CSS gurus help me figure out what we need to change? Thanks. 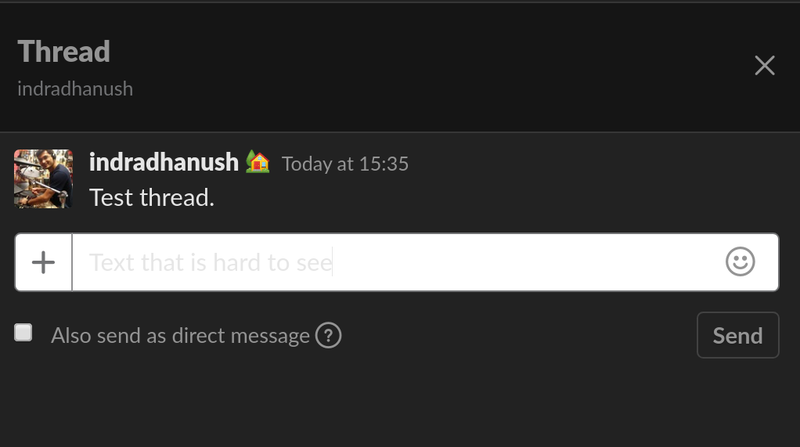 Does anybody know how to fix the number row colors for code or text snippets in slack channels/chats with dark mode enabled? (I have already added all the updated dark mode fixes from this thread). I've added the channel previews now: LanikSJ/slack-dark-mode@0d9d74a it's not perfect so some suggestions welcomed. @Dokixi try the code in my repo, seems to work for code / text snippets. 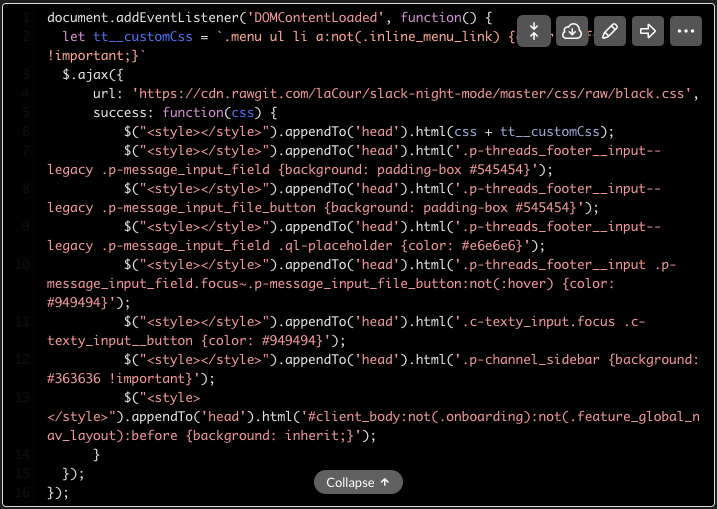 @LanikSJ I have added your updated code in the "dark-theme.css" file, which I have added in the "Resources" folder in the Slack application files, and I have added your "event-listener.js" code into the buttom of the "ssb-interop.js" file in Slack. My bad I see what you mean now. I also see no text when you attach screenshots. The text is the same color as the background. I'll work on that when I have time and see if I figure things out. My code snippets are still white background/black text (like dark mode is not applied to them at all). They don't look like the example above. Cloned latest repo. Ideas? Hi all. This all worked for me until @indradhanush pointed out that the thread replies were hard to see. I was then confused on @samjhill's comment on the new code line to add. Everything is back to white. 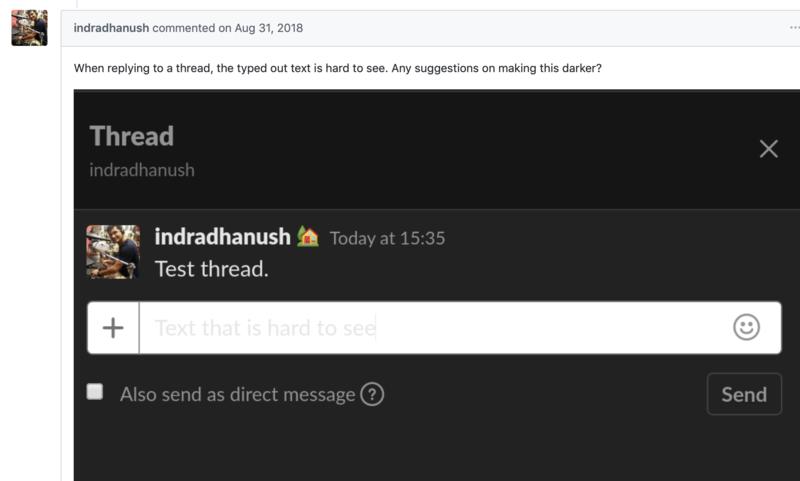 Can someone provide me with the full code, including adding the dark mode thread replies? Thank you. Download the file https://raw.githubusercontent.com/LanikSJ/slack-dark-mode/master/dark-theme.css to this location : /Applications/Slack.app/Contents/Resources/dark-theme.css then add at the end of /Applications/Slack.app/Contents/Resources/app.asar.unpacked/src/static/ssb-interop.js. I'm still no closer to figure out the numbers in code blocks and the attachment text. I'm open to ideas. Main project is using the web app with stylesheets. Personally I'm using the Mac App so I can't contribute what I'm doing back to the project. just recently, Slack updated its -beta, and the re-install naturally overwrote away my changes from this gist. so i came back to re-install. If you want to be a bit cautious on the security front, you can download the css from the css to a file (i.e. /Applications/Slack.app/Contents/Resources/slack-black.css) and load it from disk instead of over the internet. get rid of the 3 now unnecessary lines in his change, since the .css has been updated to include them.